Here is a simple and inexpensive fine motor activity that can be revisited over and over again. It is quite sculptural and very colourful. 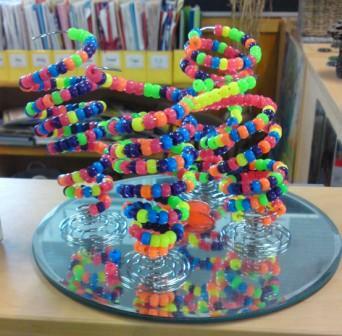 To enhance the process further you can encourage the children to make patterns using the beads. The base for these are the wire egg cups that can be purchased at most “cheap shops.” I bought a set of four egg cups for $2.95. 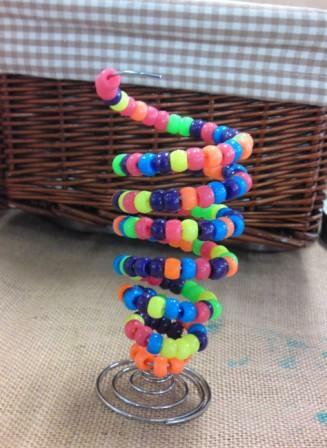 I stretch the egg cups out so that there is more space between the spirals and the children thread pony beads onto the wire. Hi Amber. I bought the mirrors from The Reject Shop 2 years ago.